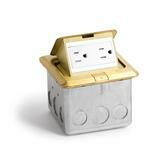 The Lew Electric PUFP-SQ-BR is an indoor pop up power floor box with brass top. It conceals two 15A power outlets in your floor, when needed slide the button on top and your power outlet will pop up to a 45 degree angle. When you are done you can close the lid till it latches shut. The box features a brass finish top and adds a nice look to any location that needs concealed power. 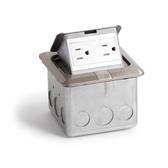 The box features a scrub water tight construction and the outlet is tamper proof. The pop up meets code for USA and Canada applications. The pop up includes the back box for installation and has 3 knockouts on each side of the box and 4 knockouts on the bottom to connect to. The Lew Electric PUFP-SQ-BR can install in any indoor application in wood or even concrete when you need to hide your power outlet. It is an ideal choice for residential installations as well as commercial with its scrub water tight rating. The Lew Electric PUFP-SQ-BR is UL recognized in the USA to code 498, 514A, 943, and 1059. It is also C-UL recognized for Canada to code 22.2 #’s 42, 158, and 18.1-04. The outlet is UL listed to code E60120. The box also meets NEC code 210.52C and the outlet is tamper proof.